Students at the St. Athanasius School work on a project in the new science, technology, engineering and mathematics laboratories. The school opened the STEM labs in early October and has since changed how classes are structured and taught. With its new science, technology, engineering and mathematics laboratories, the St. Athanasius School in Evanston is looking to modernize its education to a 21st-century standard. St. Athanasius School is a private pre-K through eighth grade school that has previously taught STEM programs for its younger students. The goal of the labs, which opened at the beginning of October, is to further develop students’ problem-solving and collaborative skills, assistant principal Mary Quish said. “Prior to having the STEM labs, our tech classes were limited to K-6, and our seventh- and eighth-graders were not learning the tools they needed to succeed in 21st-century learning,” she said. 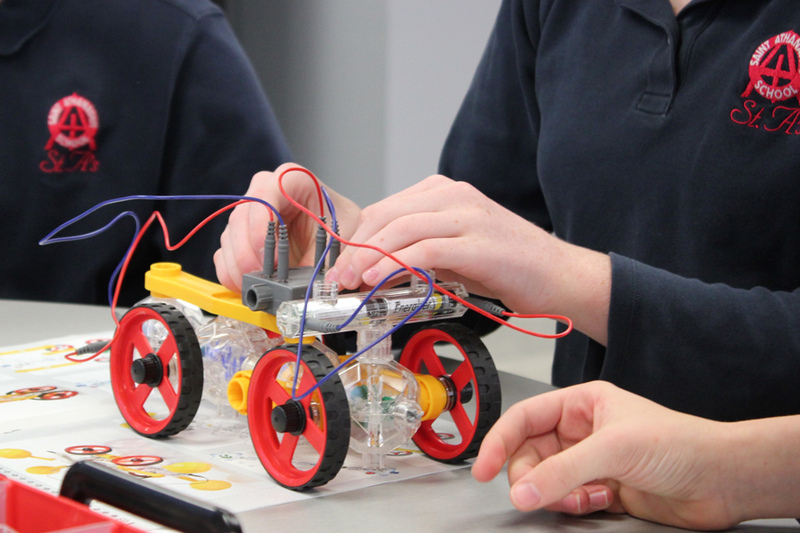 Mary Vitaioli — a seventh- and eighth-grade science teacher at the school — said high-tech light sensors, coding software to design robots and 3-D printers have been added to the STEM program. She said the new technology has increased student interest in the science and math curriculum. Vitaioli said the overall structure of the classes taught at St. Athanasius has changed drastically since the labs were built. Because the curriculum now ensures students build and create projects, they are able to engage in clearer “goal-based learning,” she added. This method is much more rewarding for students because it forces them to come up with solutions on their own, rather than relying on teacher assistance, Vitaioli said. The school began developing the labs three years ago, Quish said. After surveying different schools’ resources to decide what was best for St. Athanasius, it contacted the Colorado education company Creative Learning Systems for help designing and planning the space and program, she said. After planning the labs’ design, the school focused on fundraising, which it achieved primarily through a partnership with the St. Athanasius Parish, Quish said. Together, the school and the parish submitted a case study to the Archdiocese of Chicago, identifying the labs as a primary need for the school. Once the case study was approved, money raised by the St. Athanasius Parish was given to the school to develop the program, she said. Parent and school board member Aileen Cruz said parents have responded positively to the STEM labs because they have positively impacted children’s learning. The introduction of the labs has increased the presence of STEM learning in the lives of students and has allowed them to experiment and discover the field on a deeper level, she said. Cruz said the impact of the STEM labs on her eldest daughter was very noticeable, with the introduction of a hands-on curriculum increasing her enjoyment of the sciences significantly. “It’s bringing these things that can be very lofty, and hard to describe concepts, down to this very enjoyable, fun level,” Cruz said.